Invasive species have become a problem in marine environments around the world, and the Chesapeake Bay and its tributaries are no exception. Non-native species of fish, crustaceans, shellfish, mammals and plants have all found their way to the Bay by various methods, but their impact is often very similar. These invaders have the power to out-compete and prey on native species, causing damaging effects to ecosystems and local economies. Scientists at the Smithsonian Environmental Research Center (SERC) in Edgewater, Md., have been at the forefront of invasive species research in the Chesapeake Bay for 50 years. Their research helps them understand how exotic species arrive and impact the Bay’s ecosystems―information that can potentially help control non-natives. Here are three invasive species that SERC scientists are studying in order to stop their spread. Native to the Mississippi, Ohio and Missouri rivers, blue catfish (Ictalurus furcatus) were introduced to Virginia for sport fishing in 1974. Since then, these non-native top predators have expanded their range into many of Maryland’s tributaries, including the Nanticoke, Patuxent, Choptank, Susquehanna and Sassafras Rivers. Due to their large size and predatory habits, blue catfish are consuming many native fish species at an enormous rate, and they have few natural predators that can prevent them from out-competing native species. SERC scientists are working to understand the habitat use, diet and ecosystem impact of the blue catfish. One method they use to study the feeding patterns of this non-native is to analyze their stomach contents, using DNA analysis to determine the species of visually unidentifiable gut contents. The scientists found that the non-native blue catfish in the Chesapeake area are feeding mainly on shad, menhaden, blue crab and river herring―all native species. 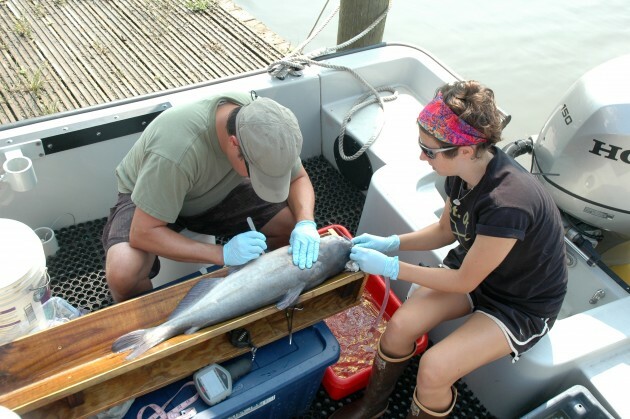 Scientists at SERC are also are tagging individual catfish with acoustic transmitters to track movement, migration, habitat use and possible dispersal among the tributaries of the Chesapeake Bay. Knowing where blue catfish are in the Bay and how they move around it will be vital information for future efforts to control their populations. SERC researchers have been on the leading edge of a relatively recent invasion in the Chesapeake Bay area. In June 2005, a local waterman delivered a Chinese mitten crab (Eriocheir sinensis) to SERC for identification. It was the first specimen of this non-native species ever captured in the Chesapeake Bay. Scientists suspect the crabs arrived in the Chesapeake Bay the same way they did 13 years earlier in San Francisco Bay―as larvae carried in the ballast water of cargo ships. As its name suggests, the Chinese mitten crab is native to East Asia. They are a big concern in the Chesapeake because they can cause considerable damage, eroding embankments with their burrows, fowling fishing gear and clogging water intake equipment for power plants. It is still unclear how established the Chinese mitten crab is in the area, although female crabs have been found with eggs―proof that the crabs are mating. 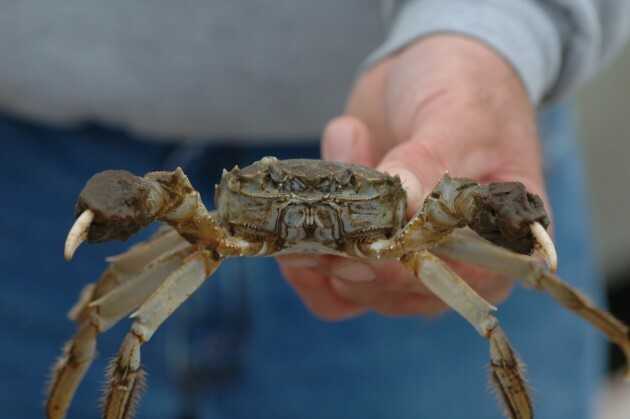 To get a clearer picture of this invasive crab’s presence and impact in the Bay, SERC researchers are turning to citizen science for help: They’ve asked the public to report any mitten crab sightings with details of the location. The scientists use this information to determine the status, abundance, and distribution of this species. Phragmites is a large perennial grass found in wetlands throughout temperate and tropical regions of the world. North American wetlands functioned rather well with its own subspecies, Phragmites australis (ssp. americanus), for centuries. However, the European subspecies (ssp. australis) was introduced about 200 years ago and is now an aggressive invader of wetlands in the Chesapeake area―crowding out native plant species. The odd thing about this plant aggressor is that it hasn’t been consistently invasive throughout the past 200 years. Smithsonian scientists realized that phragmites has only recently begun to spread explosively. Through research and partnerships, the scientists at SERC found that a patch of the non-native Phragmites needed genetic diversity within that population, something that can take many years or decades to build up, to produce significant numbers of viable seeds and thus spread. 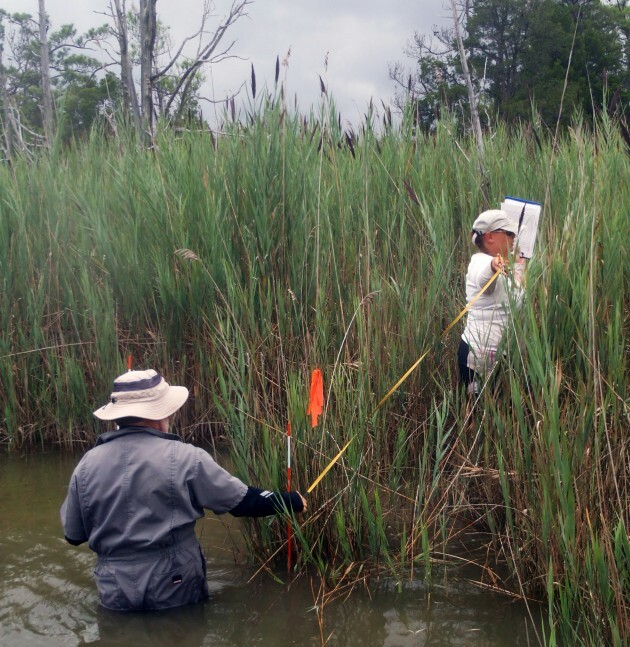 While massive management and eradication efforts are underway across the continent, SERC scientists are studying how the genetic diversity of phragmites patches affects their ability to grow and spread in response to elevated CO2 and nitrogen. They are using this information to understand how the spread of phragmites is likely to change in the future and to find ways to improve management.